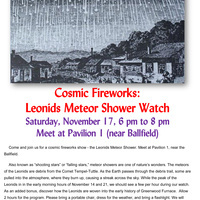 Come and join us for a cosmic fireworks show - the Leonids Meteor Shower, on Saturday, November 17, from 6 pm to 8 pm. Meet at Pavilion 1, near the Ballfield. Also known as “shooting stars” or “falling stars,” meteor showers are one of nature’s wonders. The meteors of the Leonids are debris from the Comet Tempel-Tuttle. As the Earth passes through the debris trail, some are pulled into the atmosphere, where they burn up, causing a streak across the sky. While the peak of the Leonids is in the early morning hours of November 17 and 18, we should see a few per hour during our watch. As an added bonus, discover how the Leonids are woven into the early history of Greenwood Furnace. Allow 2 hours for the program. Please bring a portable chair, dress for the weather, and bring a flashlight. We will have red cellophane to put over the light.